“Myanma Hsaing Waing” is a musical ensemble that you can see only in Myanmar. It was appeared in Kanboung Dynasty and it’s a grand one which takes the main place on bright stage. 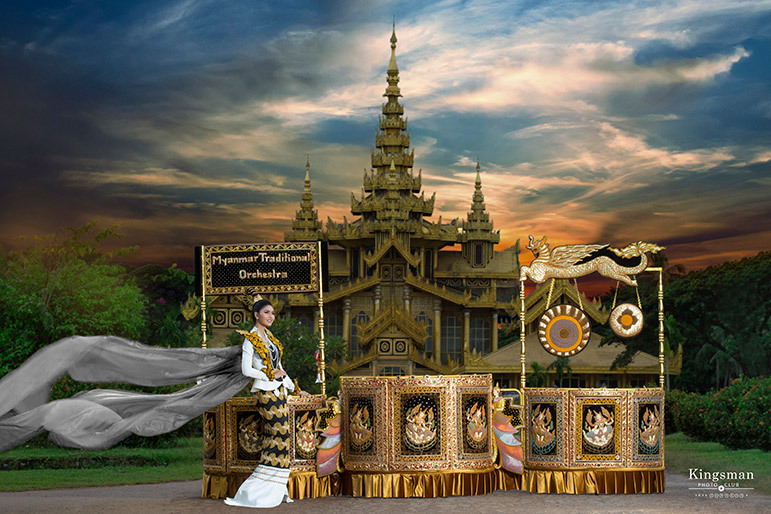 The scene describes the front view of Myanma Traditional Musical ensemble “Hsaing Waing” on straight. 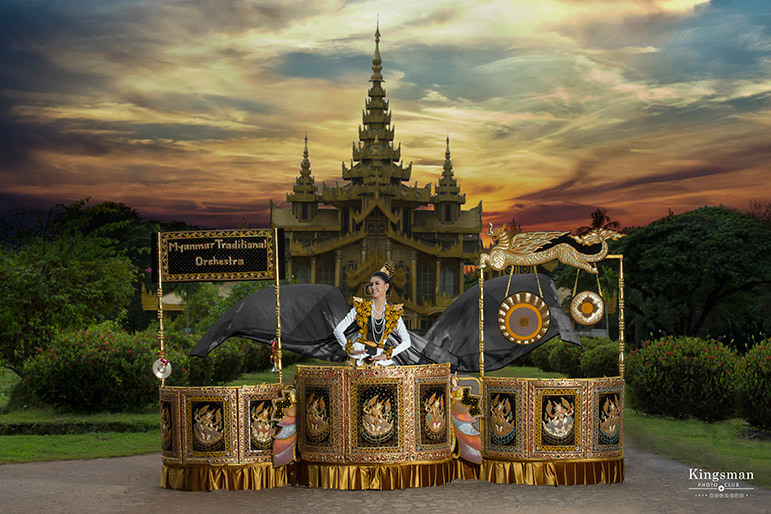 The replica of Pat Waing will be wrapped and drawn by Miss Myanmar “Zun Than Sin”. Then the folded Brass Drums, Big Drums and Pyin Sa Rupa will be displayed by unfolding. When it is unfolded, Brss Drums along with the name board of the band can be seen on the right side. Big Drums & Gong hanging from Pyin Sa Rupa and also the Side Drums can be seen on the left. All of these things are made up of Myanma Tradional gold embroidery. Pat Waing, Brass Drums and Big Drums are framed by the teak and also decorated in mosaic on every teak flat. Reinforcing musical instruments like bamboo claps, cymbals and oboe are also displayed by hanging under the name board. 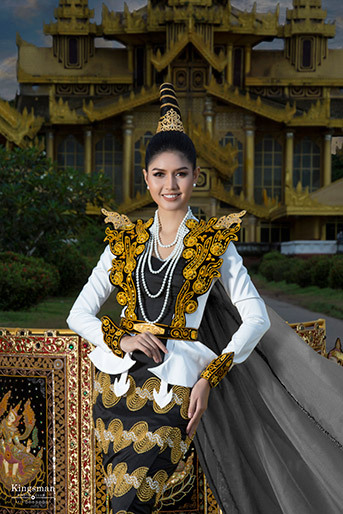 Miss Myanmar “Zun Than Sin” will perform as a Hsaing Saya, and her dress ins innovatd upon those of Kanboung Dynasty actresses. The ornaments are made up of Myanma traditional gold embroidery and it is also decorated with gold. Gold chain and decoration Ka Note Pan of main wig are also made up of gold.